Technology Support, Maintenance, & Care Service Demonstration Presentation grew from the desire to equate the manifestation of digital waste with physical waste, and to find ways to echo that theme through visuals, sound, and two main repetitive action. Through this performance, I hoped to both blur and obscure the lines between the position of the maintenance worker, the fruits of their labor, and the space in which these actions take place. I also wanted to make a clear connection between the non-ephemerality of digital and physical trash. Just because something is no longer on your screen or in your trash bin does not mean that it has been permanently erased or disposed of. Landfills and data storage centers are bursting with “trash”, and causing enormous environmental impact in order to maintain storage. 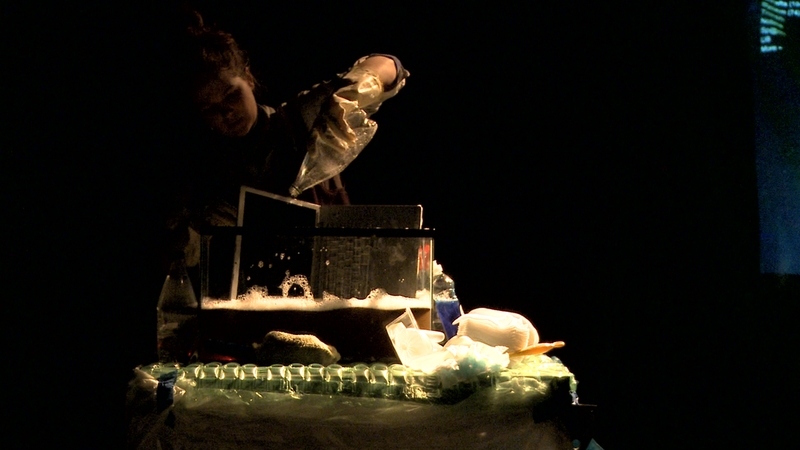 The premise of the performance, as implied by the title, is a demonstration of care and technology support, to help one maintain their machine. Flyers advertising the event were distributed amongst the audience, which, through hyperbolic accentuations of the processes of cleaning a Gmail Inbox and bathing a laptop, further obscured the intentions of the activities involved in the piece. 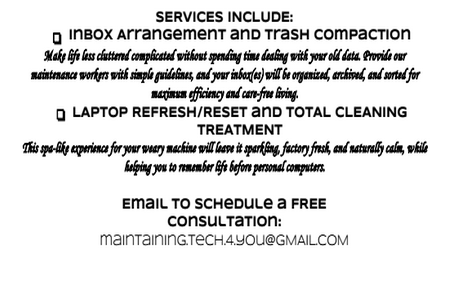 I acted as a silent facilitator of cleaning rituals to be acted on machines, both digitally and physically, as worker for the Maintaining Tech 4 You Corporation. I worked both clumsily and thoroughly, overly efficient with my practice of scouring a Spam folder, while curated messages piled in, making my efforts fruitless. 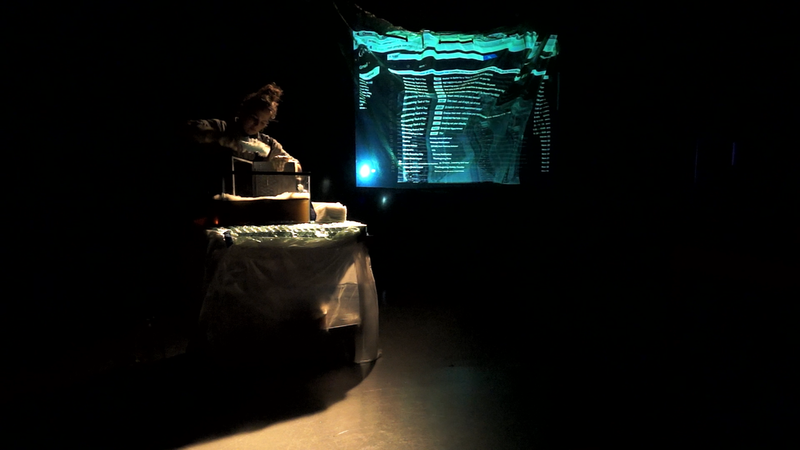 The performance set consisted of two projections, both rear projected onto a piece of green construction plastic, which was suspended from the ceiling by wire cable. The larger projection featured a Gmail Inbox’s spam folder, and the smaller over layed projection played a slideshow of selected images varying from 3D stock imaged trash cans, large gloved cursor hands, landfills filled with plastic, landfills filled with recognizable keyboards, stock photos/illustrations of home care workers, stock photos/screen captures of data storage centers, stock images of “The Cloud”, and still frames of Google’s data center tour. The sounds, collected and recorded, staged the two aspects of the performance. 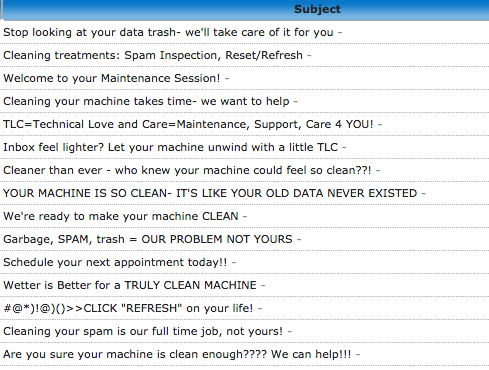 As I entered the space to silence and began to set up my laptop-bath cart (much like a cart artifact of a janitor), a Windows recycle bin sound bytes, garbage truck snorts, and the crumple sound of data entering Apple’s trash bin began to play, and I retreated behind the curtain, where I began to painstakingly clean the Spam folder on screen. The second component of the performance was signaled by silence, and brought my character to the front of the screen. As sounds of three-times-recorded, glitchy waves began, I prepped the bath tank, and at the appropriate sound cue- a reverberating microphone’s mournful screech, I uncovered a MacBook, which I proceeded to wash scrub, pouring colored water from plastic bottles and coffee grounds over the keyboard. 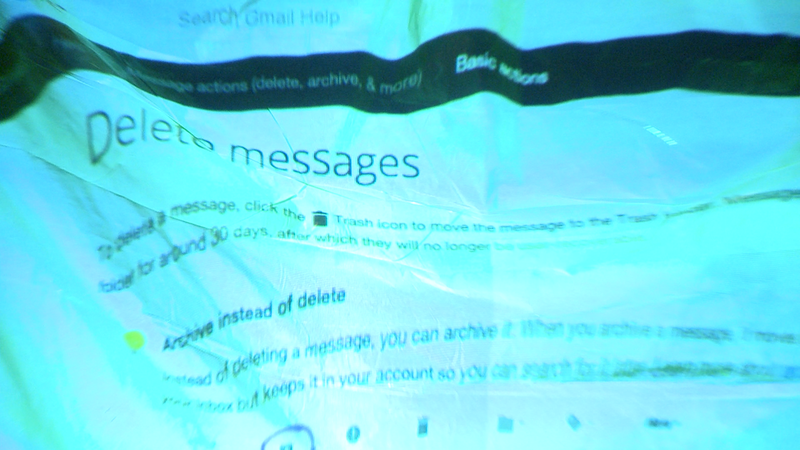 The performance culminated when the sounds of technology in distress faded away, and I was rushed back to the projected Inbox by the sounds of digital waste. I immediately trashed the last spam messages, hitting the “Delete Forever” button as my final act. 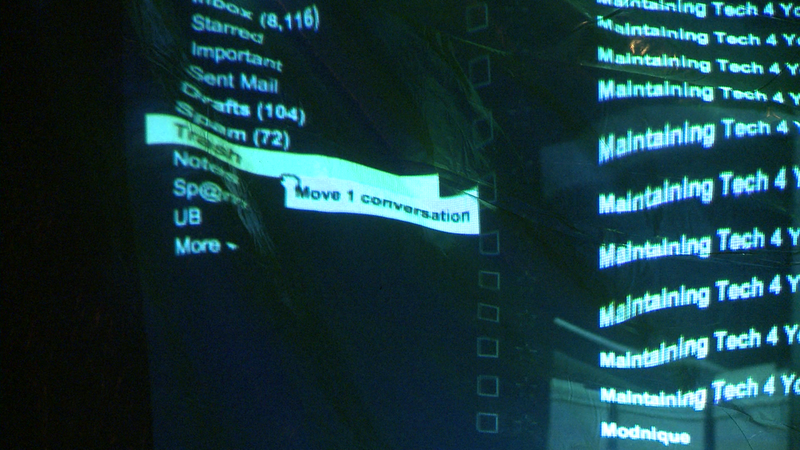 I am particularly interested in the spectator position as the viewer is forced to witness something private and mundane, actions that the viewer might accomplish in their own life but never as a shared experience, such as cleaning out an inbox. I wanted to conceive of the process of cleaning someone else’s data for them, coupled with the disastrously troubling and oddly pacifying action of physically cleaning a machine as if it were flesh, continuing the conflation of the actions of maintenance over and with technology.